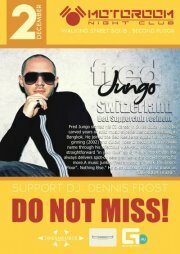 Fred Jungo started his DJ career in Swiss clubs where he carved years of solid music experiences before settling in Bangkok. He joined the Bed Residents squad from the beginning (2002) and quickly rose to become a household name through his infectious week-end sets.Known for his straightforward “in your face” style, Fred’s impeccable mix always delivers spot-on sets that leave the crowd crying for more.A music junkie, Fred’s motto is “Work The Dance Floor”. Nothing Else.” He even coined his style of music as “BIG ROOM HOUSE”.